We crossed the Marmara to Istanbul on the Bandirma ferry – a huge, aluminium, Australian made high-speed catamaran. On today’s flat seas it cruised at 32 knots (> 60 km/h) leaving a long white plume of aerated water but scarcely any wake. It was not full but was carrying about 200 cars and 400 people in very comfortable, spacious surroundings. Manoeuvrable, a fast turn around – impressive. While waiting in the queue with cars we were befriended by a young turkish man named Imdat (it means help in Turkish). Imdat lives in Rotterdam and had driven to Turkey to participate in a TV game show or something similar. Contrary to our expectations and the waiter’s we couldn’t get breakfast at a Bandirma cafe because it was the end of Ramadan or so the kitchen staff told him. End of the end of the end of Ramadan more likely! Not a good start to the day after bad night dealing with mosquitoes in our room. We started to get anxious about the lack of ferry but it eventually arrived and left only six minutes late. It was a grey and smoggy day in Istanbul – poor air quality. We’re glad we didn’t try to cycle through the sprawling outskirts of this huge city. The ferry was a much better way to arrive. 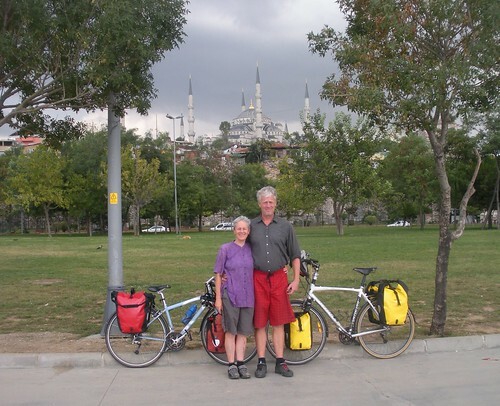 I’m a bit shell-shocked by Istanbul – it’s unimaginably huge, frenetic and in-your-face – especially the spruikers! You can’t soften a blunt rejection with the slightest politeness otherwise it is taken as an opportunity for a follow-up assault. They present a faux chumminess that we haven’t encountered before – quite off-putting (almost offensive) and it’s becoming increasingly easy to brusquely wave them away. 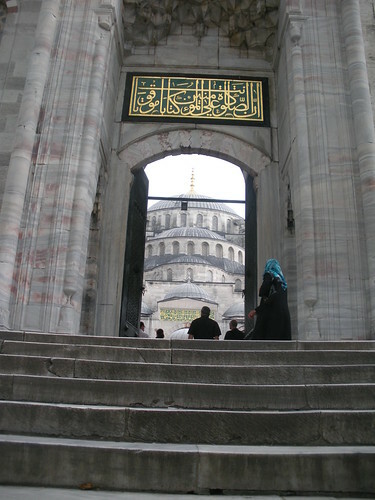 We had a carpet salesman experience as we approached the Blue Mosque, but we didn’t crack, not even a bit. We’re facing up to the challenge of getting our bikes packed for shipping (either with us to Amsterdam or hopefully direct to Australia). I hope it’s not going to be too difficult. The first quote I got today was US$1300 as UPS’ cheapest low-priority rate to Australia! I’m sure the person made a mistake. By the way, UPS website is absolutely crap and extremely aggravating! Incredibly slow and often returns errors on simple form submissions. Shame on you UPS! On any assessment one can confidently state that Istanbul has plenty of mosques (they’re called camii here – pronounced something like jarmy)! It’s crazy when the amplified muezzins get going! 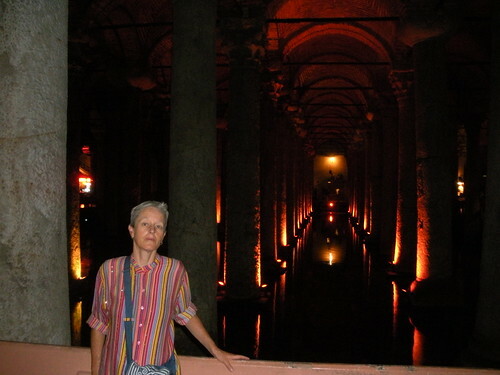 We’ve slipped into tourist mode and taken in the Blue Mosque (only 200 metres from our hotel in Sultanahmet), Hagia Sophia, Basilica Cistern, Hippodrome… In the middle of the Hippodrome there’s an Egyptian obelisk about 3500 years old. It was placed in its current location a mere 1600 years ago. Nevertheless it appears almost brand new with crisp, sharp edges to the carved hieroglyphs – amazing, especially compared to much of the mouldering stonework around the city. The Blue Mosque is imposing and quite beautiful from the outside but the interior seems marred by its 4 over-sized pillars. Perhaps they’re intended to be making a statement about solidity and strength but their overstatement undermines the intention. Also, the lighting inside looks terrible. It’s a huge array of small lamps fixed to horizontal steel frames hung barely 4 metres above the floor from hundreds of vertical steel cables presumably bolted through the ceiling tiles. It makes the place claustrophobic despite the vast internal space and conceals the tiled dome. Female worshippers are relegated to rear of mosque *behind* the tourist masses. 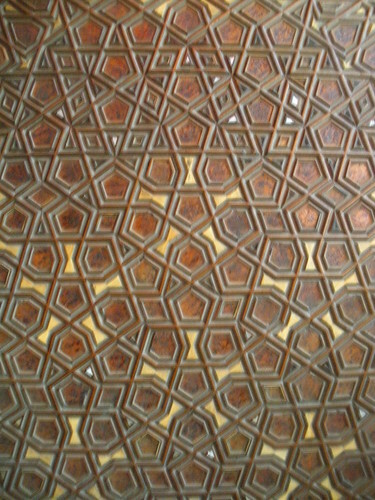 Roger Penrose would like the five-fold symmetry in the carved door patterns. There are lots of unsympathetic treatment surrounding major historical buildings – park railings, light poles,etc that make it unnecessarily difficult to get an unimpeded view (let alone a photo). Islamic architects need to get their mojo back. We visited the Grand Bazaar. It’s unbelievably big (maybe 500 m square or more) with aisle after aisle teaming with stalls, spruikers and shoppers. 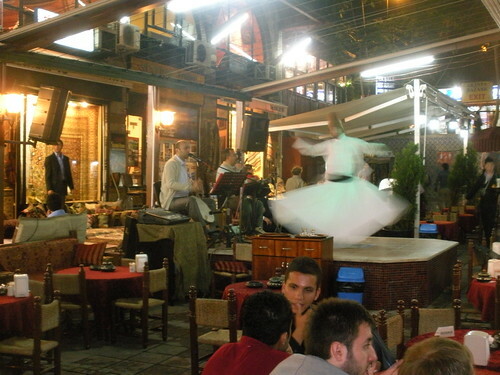 We had supper in an understated but still touristy area between our hotel and the Blue Mosque where a Dervish was whirling with high felt hat and billowing white clothes to a pair of Sufi musicians who continued their set after he’d spun off (presumably) to another gig. This entry was posted on 14 September 2010 at 7:47 pm and is filed under Turkey. You can follow any responses to this entry through the RSS 2.0 feed. You can leave a response, or trackback from your own site.